Starting College – We’ve Worked Toward This Goal Forever! 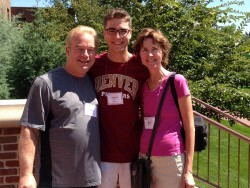 Our son, Morgan, started college at the University of Denver (DU) this week. What a step it is to let him go, to make his own decisions, to take care of himself in the dining room, and to teach whomever he wants to teach about administering his EpiPen! This is what we’ve worked toward since he was first diagnosed with food allergies. It’s likely that he will make decisions different than I would, or than his Dad would. That’s part of growing up and learning! We had worked toward his first day of college with DU Administrators for a while. Morgan, my husband and I met with the Disability Services Office back in March when we toured the campus. We discussed what accommodations he would need – safe food, no allergens in his room (no peanuts, tree nuts, sesame, fish or shellfish), and an A/C unit in his dorm room to mitigate his asthma. They didn’t think any of these would be an issue, but required that we complete some paperwork to get the university to pay for his A/C unit. We were given contact names for the chefs at DU to personally speak with them, and it was up to Morgan to discuss his needs with his roommate. If there was an issue, he could then get ‘outside’ help. We problem solved various scenarios with the Housing Office at DU what could work for Morgan to attend DU if he was unable to get dining services to provide safe meals, and/or unable to get the roommate situation worked out. One of the Housing Office’s student employees has food allergies, and she talked in detail with Morgan about how she was safely able to eat in the dorm, how she texted chefs about her meals, and never had any allergic reactions! That encouraged us, but we also wanted a back up plan. The Housing Office offered that he could live in a dorm that had a kitchen in between two rooms. He could then have an RA (Resident Advisor) living in the other room to lessen the need for education of his food allergies. (Normally 4 boys live in these rooms, 2 on each side). Morgan would then have to shop and cook for himself. His preference was to live in a ‘regular’ dorm room with the Pioneer Leadership Program (PLP) – a Living and Learning Community that he applied to participate with. His one roommate would be a boy within this program, and Morgan would therefore eat in a dining hall. Morgan and I roll played a few scenarios: what would you do if a professor is eating one of your allergens? (His answer: probably nothing unless I had to shake a hand, and then I’d tell them.) Where is the nearest hospital? (He looked on a Google map to find one). What would you do if your roommate is eating one of your allergens? (His answer: Talk to him about it!) What would you do if you knowingly ate one of your allergens – accidentally – but didn’t have any symptoms? (His answer: give myself an EpiPen and then call 911). Morgan had several conversations with the head chef at DU over the summer, and he felt confident that he could live in the PLP dorm and eat safely since the cafeteria already labeled all of the foods that they made, and all the chefs were trained on food allergy awareness. Morgan and I met with the chefs one week prior to the school year starting. I wrote about that in a blog post here. Morgan received his roommate assignment in July and started Facebook conversations with the young man. They met for the first time a few weeks before school started in a coffee shop in our hometown when his roommate was visiting extended family. They talked for 3 1/2 hours, and Morgan came home and said he never mentioned food allergies! I almost wanted to step in and start a conversation about how important it is for his roommate to be aware of his food allergies! Instead, I decided that I needed to step back and let him manage it. Morgan did mention his food allergies in a text message (kids these days!!) a few days prior to showing up at DU. His roommates response was, “Darn, I was really planning on eating fish in the room!” Apparently, it was no big deal to him at all to keep Morgan’s allergens out of the room. When we arrived at DU, carting wheelbarrows worth of clothes and accessories into Morgan’s dorm room, we found the newly purchased A/C unit in a box. After inspecting the unit, my husband determined that he hadn’t brought the proper tools to put it together. I called the Housing Office to ask if someone was able to put the unit together for us. Within 5 minutes, the director of Housing was in Morgan’s room introducing herself! She called maintenance who had the unit operating within the hour!! Amazingly quick work! Morgan has been sleeping in air conditioning ever since. His roommate’s mother was thrilled since hayfever was a common issue for her son. She was hoping his allergies get better too! Morgan brought practice EpiPens with him to college, with plans to train his roommate and others in the PLP program. Several of the chefs we met are EpiPen trained. Morgan is also capable of administering the EpiPen to himself. This is something I have to let go of. Morgan has ALWAYS carried 2 EpiPens since he was in middle school. I trust him to properly care for himself by training others. At lunch the first day, Morgan went and talked with his chef contact about what was safe to eat, and whether he needed anything specially made. My husband and I were at DU for three days of Parent Orientation, and also ate in the cafeteria with the students. I was thrilled that they had a microwave out in the dining area for me to heat up my special meals, and my husband was thrilled with the tasty food! Morgan has had no problems finding safe, healthy food at each meal. At the last lunch that we ate with Morgan before we departed, the chef came up to him and asked him, “Where were you at dinner last night?” Morgan told him that he ate at a different dorm cafeteria, to which the chef replied, “Here’s my cell number. Make sure to text me when you don’t eat here so that I know you’re okay!” How wonderful that was to hear! This is just the start for us, but a very good start it was! It takes a good amount of planning to get your child with food allergies to college, but it can be done. It can be especially rewarding when the college is so well-informed and willing to provide excellent care! Previous PostOff to College – But Meet with the Dining Staff First!Next PostOne week into college – and he’s sick!